The resurgence of one of the most important franchises in the NHL, that of the Chicago Blackhawks, provides plenty of opportunity for collectors and speculators to acquire and cash in on rookie cards from this relatively young corps of emerging Hobby superstars. If you want to get in, it's not to late and trust me when I say that this team will contend for, and win, the esteemed Stanley Cup in the next few years. Periodically I'll help interested parties identify the teams' stars, their rookie cards and current market value as well as my speculation on where those cards could go after the Blackhawks eventually win The Cup. Hockey collectors differ from all other sports in a very significant way. While many do follow the same mold of traditional team oriented collecting, the hockey fan and collector has such an appreciation for the game that collecting the league's best players becomes a priority, regardless of what team they play for. Secondly, while a player's value will always be highest in the city he plays for, where that player comes from also carries highly competitive secondary market value tendencies. This can mean that a player such as Patrick Kane from Buffalo will not only have value to collectors in his home city but also the teams he played for in the Ontario Hockey League en route to the NHL. Combine all those factors with players of European decent and you add another geographic area where a player's card prices will be impacted. "Toews was selected first overall in the 2003 WHL Bantam Draft by the Tri-City Americans, but chose instead to play college hockey at the University of North Dakota. Prior to joining the North Dakota Fighting Sioux, he played 2004–05 at Shattuck-St. Mary's, a boarding school in Faribault, Minnesota. He scored 110 points in 64 games in his only season with the team. Toews played two seasons at North Dakota, compiling 85 points (40 goals, 45 assists), a plus-38 rating and a 56.7% faceoff winning percentage in 76 games. He helped the Fighting Sioux reach the NCAA Frozen Four in both 2006 and '07. Toews' registered 39 points as a freshman and earned Rookie of the Week honours twice. He helped North Dakota capture the Broadmoor Cup as WCHA champions and also was named West Regional MVP after tallying five points. 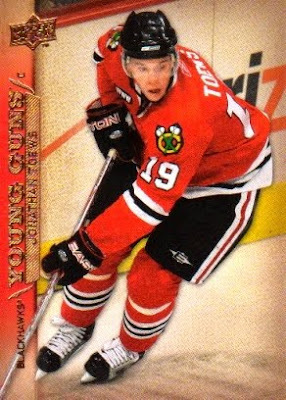 Going into the 2006 NHL Entry Draft, Toews was ranked third overall by NHL Central Scouting and was chosen third overall by the Chicago Blackhawks. In 2007–08, he opted out of the final two years of college hockey to debut with the Blackhawks after signing a 3-year, entry level contract on May 16, 2007. He scored his first NHL goal on his first shot in his first game on October 10 against the San Jose Sharks. He then recorded the second-longest point-scoring streak to start an NHL career, registering a point in each of his first 10 games (5 goals, 5 assists)." On the collectibles front he has many rookie cards but the staple for any hockey collector is his 2007-08 Upper Deck Young Guns RC (pictured above). A non-serial numbered, non-auto, non-relic card that is a "true RC". Prices vary wildly depending on whether the card is graded or not. A raw copy can currently be had in the price range of $30 based on a look at recently completed secondary market sales. However, this card has tremendous potential and could increase in value 300-400% when the Hawks eventually win The Cup. Typically, this card has seen trading in the $60 range, but with the team's recent play and early season predictions to contend for Lord Stanley's Cup as early as this Spring, many people have opted to sell now creating a bit of a glut. However, this will not last. Trust me. Now is definitely the time to buy. Very true about captain clutch up there. Don't forget the 5 (in a row during the same game) shootout goals he had against USA while playing for Team Canada in, I believe, the World Junior Championships before joining the Hawks. Also tabbed as the next Steve Yzerman. Jakks Pacific Delivers a KO to McFarlane . . .
Who Won the Tobacco Wars of '09? Topps Going Out With A Bang!